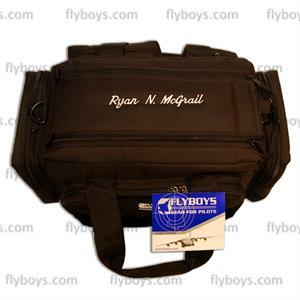 Embroider this flight bag and make it your own. The Flyboys Crew Flight Bag is full-featured and constructed of premium materials designed to withstand years of heavy use. Make this flight bag your own with custom embroidery. Choose custom embroidery work from the drop down box above. You can also provide specific details and requests on the "Customer Notes" section at Checkout. The FB3300LG with Name Only in Script lettering. In most cases for name only, on this product we will use 1 inch lettering. Longer names might be scaled down to .75 inch or as required. Items that have been custom embroidered CANNOT BE RETURNED OR EXCHANGED unless FLY BOYS has made the mistake. We go solely off of the information that is placed in the Customer Notes Section at checkout, so check twice for correctness. Thank you, we are looking forward to putting the final touch on your new Fly Boys gear! Completion Times on Embroidered Flight Bags: Officially, we still work against our published time of 7 business days for shipment, but typical turnaround time is ONLY 3 to 5 business days, and many times we complete orders on the same day! Continual updates to the FB3300LG keep this awesome bag at the top of the World Best Seller list! Lightweight but heavy duty bag and at a very fair price. After incorporating suggestions from the field and making material upgrades to this bag we've made a crew bag that outperforms every other bag and does it at a lighter weight and price. We still have all of the features you will need to get the mission accomplished, and it provides even more value. Double stitching and reinforced seams are standard. Silent rubber zipper pulls now make it so you're not clanging along in the squadron or flight line. The awesome nylon zippers are self repairing and provide a significant level of water resistance. The removable shoulder strap has a pebbled shoulder pad unique only to Fly Boys. This keeps the bag from slipping off of slick nylon shell flight jackets. Take a look at the expanded photo to see just what you can carry in this bag. It has ALL the features you need at a price you can afford. Also incorporated into our current design is an all gray interior which is not as dark as a black interior and provides enhanced visibility for finding items inside the bag in low light conditions. See how sturdy the movable/removable interior dividers (2 incl with each bag) are built. You can set your bag up the way you want or need for the mission. A new retention sleeve for flashlights has been incorporated so you always know where to find it! The base of the unit is constructed of ultra-rugged 1680D ballistic nylon. This tight weave has superior abrasion resistance and adds a level of protection the the area of the bag most likely to get wet, beaten and dirty. Plus the plastic feet at each corner lift the bag off the ground and add a further layer of protection. All of these updates and the shipping weight is still under 5 pounds! Haul your gear not the bag! Exterior Dimensions: 22" x 14" x 12" Main Compartment Dimensions: 16" x 11" x 11". 2700 cu in overall cargo volume. Refer to our Flight Bag Dimensions Chart to compare sizes. Also, for more information, please click Choosing the Right Flight Bag. This Flyboys Kneeboard is our most popular pilot kneeboard designed for both VFR & IFR flying. The Pilot Pubs Bag is ideal to keep your pilot supplies together.